This cool tent features double stitching and quadruple stitching in high stress areas such as corners and other tear risk areas. It is made from top quality 0.6mm Oxford Cloth PVC / Tarpaulian that is fire retardant. 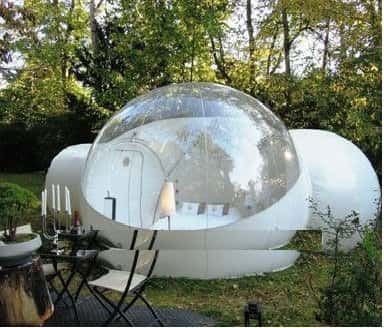 It is fantastic for camping and the clear bubble dome makes it an excellent choice as a shelter at the beach or in any other scenic area where you wish to see your surroundings. Inflating is not a difficult task and can be done by using the included blower which is supplied with a wooden case. An excellent idea for anyone who is not great at erecting traditional styled tents, it can be a complicated task for the inexperienced camper. This is a luxury tent that is comfortable, easy to use and impressive. It looks fantastic and is an excellent gift idea for any seasoned or amatuer camper. As well as being fire retardant it is also waterproof, not just useful for camping but also as a handy sun shelter that can be used during outdoor leisure activities.